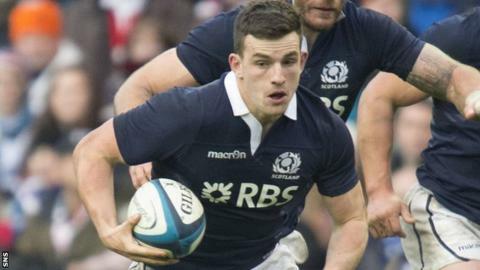 Scotland centre Matt Scott has been ruled out of the final two autumn Tests against South Africa and Australia with a fractured hand. The Edinburgh back, 23, sustained the injury during against Japan. Interim head coach Scott Johnson has called up Tom Brown, Jack Cuthbert, Lee Jones, Stevie McColl, Byron McGuigan, Ross Rennie and Jon Welsh. Scotland host the Springboks on Sunday and the Wallabies on 23 November. Four of the call-ups - full-backs Cuthbert and Brown, winger Jones and loose forward Rennie - play for Edinburgh, while centre McGuigan and prop Welsh are at Glasgow Warriors, and McColl is a full-back for Leeds Carnegie. Johnson has injury concerns with lock Tim Swinson affected by a shoulder problem and fly-half Duncan Weir struggling with a groin strain. Two more Glasgow Warriors players, Ryan Grant and Alastair Kellock, suffered concussion against Japan.